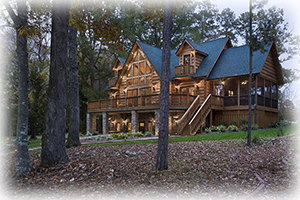 Log Homes of West Virginia offers one of the largest and most diverse selections of log and timber frame homes in West Virginia. If so desired, we provide complete building material packages and a large selection of design construction services. From our 4’’X 6” Milled “D” one room sportsman log cabin to our tremendous 12”X 12” handcrafted luxury homes, possibilities in design are limited only by your imagination. We strive to keep our homeowners our top priority, as well as adhering to highest quality standards possible. Our commitment to personalized services, attention to detail, and the ability to make your dream become a reality sets us apart from the competition. Earning respect and developing friendships is the backbone of our company. 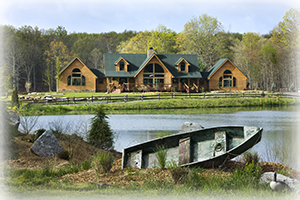 We utilize only the strongest log and timber frame materials with a full selection of construction materials and resources. Whatever the project encounters, we can supply precisely what you desire. Best of all, we put forward a PRICE GUARANTEE offering you a premium quality grade of package materials with the lowest pricing, pure and simple. Our Owner Design & Assemble Plan will provide you with all of the essential specialized support and assistance, documents, literature, and ongoing guidance to affordably make your imagination become reality. Perhaps the most important basis for this service is your capability to achieve the pleasure and satisfaction of personal achievement to be enjoyed by your family for several years to come. Success and achievement can be measured in designing a plan properly the first time. Success begins with an idea and approach to create something wonderful and everlasting that will give your home a sense of warmth and character. We understand this approach and strive to create that perfect home design. With this visualization and focus you have our complete and lasting commitment. Rest assured your home will last a lifetime. Let us assist you in designing your home.